Don’t want to wait until the weekend to take bae out? Then you must arrive in style with your SO in hand at Olive Bistro. Lovestruck Wednesdays – date nights created exclusively for couples – are for those perfect candlelight dinners. Turning the lights off, the entire space is lit up with just candles. 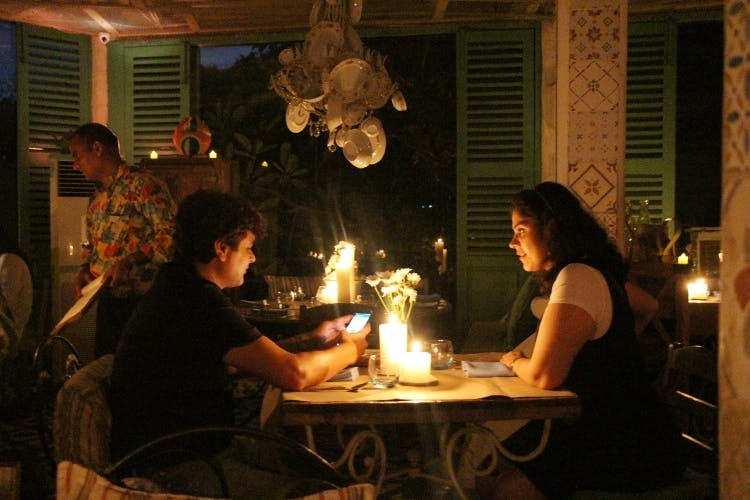 This Mediterranean themed restaurant is usually romantic enough for evening dates with the view of twinkling lights over Durgam Cheruvu, but we think Wednesdays will be simply irresistible now. If you’re opting for the indoor seating, you can swoon to the tunes of a saxophonist playing live inside. While there is no specially curated menu for this, we’d love to see if there’s something exclusive on the offer. But we say – go here for a round or two of pizza and wine with your love. Be sure to end your meal with Orange Crème Brûlée and call it a night.